CHICAGO — Nearly half (48.9%) of coin laundry owners are planning to spruce up their stores in 2016, according to results from this month’s American Coin-Op Your Views survey. Further, store owners who responded to the unscientific poll say they plan to add new washers and/or dryers (38.3%), increase prices (36.2%) and/or increase marketing efforts (29.8%). Respondents were invited to select any or all from a list of choices. Smaller shares say they are planning to add other equipment like a water heater or changer (23.4%) or another service (12.8%). A share of 12.8% say they have other initiatives planned this year, such as lowering dryer prices, reducing drop-off hours, improving lighting and signage, or even closing a store so another store garners more business. Roughly 11% are planning no changes, and 2.1% are unsure of their plans. 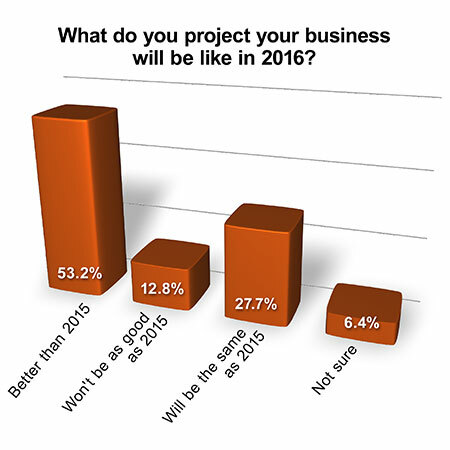 Nearly 81% of respondents predict their 2016 business will be better than (53.2%) or the same as 2015’s (27.7%). A small percentage believes “business won’t be as good as 2015” (12.8%), and the remaining 6.4% are unsure. What is your greatest business concern looking ahead? The majority of coin laundry owners who took the survey say they worry “utility costs will rise” (38.6%). 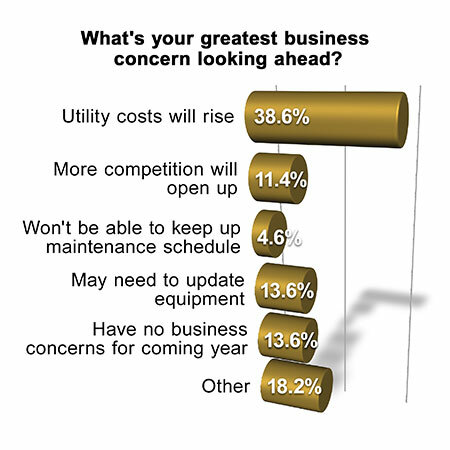 The need to update equipment concerns 13.6% of respondents, while 11.4% worry that more competition will open up. Roughly 18% listed other concerns, including marketing, finding “good help,” the increasing minimum wage, and dealing with government that isn’t business-friendly. The smallest share, just 4.6%, is concerned about keeping up the store maintenance schedule. While the Your Views survey presents a snapshot of readers’ viewpoints at a particular moment, it should not be considered scientific. Qualified subscribers to American Coin-Op’s e-mails are invited to take the industry survey anonymously online. Percentages may not add up to 100% due to rounding.